Charles Towns, owner of Towns’ Hospital where Bill Wilson had sobered up, tried to get publicity for A.A. and finally succeeded. He had known Morris Markey, a well-known feature writer, for years. Markey was intrigued by what Towns told him of A.A., and approached Fulton Oursler, then editor of “Liberty,” a popular magazine that had a religious orientation. In September 1939, when the “Liberty” piece hit the newsstands, Bill thought it was a bit lurid, and that the title, “Alcoholics and God,” would scare off some prospects. Perhaps it did, but “Liberty” received 800 urgent pleas for help, which were promptly turned over to Bill Wilson who turned them over to Ruth Hock for a response. When Dr. Bob read the story he was elated. “You never saw such an elated person in your life,” said Ernie G. the second (there were two Ernie G’s). “We all were,” said Ernie’s wife, Ruth. It was AA’s first successful piece of national publicity. The stories in the Cleveland Plain Dealer followed shortly hereafter. One result of the article was that A.A. was started in Philadelphia. George S. of Philadelphia, one of the first “loners” had sobered up after reading the article.” When the issue of Liberty first arrived, George was in bed drinking whiskey for his depression and taking laudanum for his colitis. The Markey piece hit George so hard that he went ex-grog and ex-laudanum instantly. He wrote to New York, his name was given to Jim Burwell (see “The Vicious Cycle” in the Big Book), who was a traveling salesman, “and that’s how A.A. started in the City of Brotherly Love,” wrote Bill. Jim and George gathered others to them, and the first A.A. meeting in Philadelphia was held in George’s home. Is there hope for habitual drunkards? A cure that borders on the miraculous — and it works! For twenty-five or thirty cents we buy a glass of fluid which is pleasant to the taste, and which contains within its small measure a store of warmth and good-fellowship and stimulation, of release from momentary cares and anxieties. That would be a drink of whisky, of course — whisky, which is one of Nature’s most generous gifts to man, and at the same time one of his most elusive problems. It is a problem because, like many of his greatest benefits, man does not quite know how to control it. Many experiments have been made, the most spectacular being the queer nightmare of prohibition, which left such deep scars upon the morals and the manners of our nation. Millions of dollars have been spent by philanthropists and crusaders to spread the doctrine of temperance. In our time the most responsible of the distillers are urging us to use their wares sensibly, without excess. They are, he goes on, touched with physical and mental quirks that prevent them from controlling their own actions. They suffer from what some doctors call a “compulsion neurosis.” They know liquor is bad for them but periodically; they are driven by a violent and totally uncontrollable desire for a drink. And after that first drink, the deluge. By far the most successful cure is that used by the hospital whose head doctor I have quoted. There is nothing secret about it. It has the endorsement of the medical profession. It is, fundamentally, a process of dehydration: of removing harmful toxins from all parts of the body faster than Nature could accomplish it. Within five or six days — two weeks at the maximum — the patient’s body is utterly free from alcoholic poisons. Which means that the physical craving is completely cured, because the body cries out for alcohol only when alcohol is already there. The patient has no feeling of revulsion toward whisky. He simply is not interested in it. He has recovered. But wait. How permanent is his recovery? Our doctor says this: ” Though the aggregate of full recoveries through physical and psychiatric effort its considerable, we doctors must admit that we have made little impression upon the problem as a whole. For there are many types which do not respond to the psychological approach. “I do not believe that true alcoholism is entirely a matter of individual mental control. I have had many men who had, for example, worked for a period of months on some business deal that was to be settled on a certain date…. For reasons they could not afterward explain, they took a drink a day or two prior to the date . . . and the important engagement was not even kept. These men were not drinking to escape. They were drinking to overcome a craving beyond their mental control. “The classification of alcoholics is most difficult. There are, of course, the psychopaths who are emotionally unstable…. They are over remorseful and make many resolutions — but never a decision. “There is the type who is unwilling to admit that he cannot take a drink just like the rest of the boys. He does tricks with his drinking — changing his brand, or drinking only after meals or changing his companions. None of this helps him strengthen his control and be like other people. Then there are types entirely normal in every respect except in the effect which alcohol has upon them . . .
“All these, and many others, have one symptom in common: They cannot start drinking without developing the phenomenon of craving…. The only relief we have to suggest is complete abstinence from alcohol. Among physicians the general opinion seems to be that chronic alcoholics are doomed. But wait! Within the last four years, evidence has appeared which has startled hard-boiled medical men by proving that the compulsion neurosis can be entirely eliminated. Perhaps you are one of those cynical people who will turn away when I say that the root of this new discovery is religion. But be patient for a moment. About three years ago a man appeared at the hospital in New York of which our doctor is head physician. It was his third “cure.” Since his first visit he had lost his job, his friends, his health, and his self-respect. He was now living on the earnings of his wife. Every member of the group — which is to say every person who has been saved — is under obligation to carry on the work, to save other men. That, indeed, is a fundamental part of his own mental cure. He gains strength and confidence by active work with other victims. He finds his subject among acquaintances, at a “cure” institution or perhaps by making inquiry of a preacher, a priest, or a doctor. He begins his talk with his new acquaintance by telling him the true nature of his disease and how remote are his chances for permanent cure. The new subject will generally consent to attend one of the weekly meetings of the movement. One or another of the members keeps working on him from day to day. And presently the miracle. But let me give you an example: I sat down in a quiet room with Mr. B., a stockily built man of fifty with a rather stern, intelligent face. “When I came out of it, the doctor suggested I go to one of these meetings the boys were holding. I just laughed. My father was an atheist and had taught me to be one. But the doctor kept saying it wouldn’t do me any harm, and I went. “Somebody said the Lord’s Prayer, and the meeting broke up. I walked three blocks to the subway station. Just as I was about to go down the stairs-bang!” He snapped fingers hard. “It happened! I don’t like that word miracle, but that’s all I can call it. The lights in the street seemed to flare up. My feet seemed to leave the pavement. A kind of shiver went over me, and I burst out crying. But the psychoanalyst, being of human clay, is not often a big enough man for that job. The patient simply cannot generate enough confidence in him. But the patient can have enough confidence in God — once he has gone through the mystical experience of recognizing God. And upon that principle the Alcoholic Foundation rests. The medical profession, in general, accepts the principle as sound. “Alcoholics Anonymous” have consolidated their activities in an organization called the Alcoholic Foundation. It is a nonprofit-making enterprise. Nobody connected with it is paid a penny. It is not a crusading movement. It condemns neither liquor nor the liquor industry. Its whole concern is with the rescue of allergic alcoholics, the small proportion of the population who must be cured or perish. It preaches no particular religion and has no dogma, no rules. Every man conceives God according to his own lights. The Foundation has lately published a book, called Alcoholics Anonymous. And if alcoholism is a problem in your family or among your friends, I heartily recommend that you get hold of a copy. It may very well help you to guide a sick man — an allergic alcoholic — on the way to health and contentment. In the spring of 1971, the newspapers reported the passing of Bill Wilson of New York City, who as one of the two co-founders of Alcoholics Anonymous. The other co-founder, Dr Robert Smith of Akron, Ohio, has passed on some years earlier. Shortly after Bill’s death, the Akron Alcoholics groups asked my mother Henrietta Seiberling, to speak at the annual “Founders Day” meeting in Akron, which is attended by members of Alcoholics Anonymous from all over the world. She lives in New York and did not feel up to traveling, so they asked me to speak in her place. I agreed to speak but felt that it would mean most to them to hear some of her own words, so I called her on the telephone and asked her to tell me about the origins of Alcoholics Anonymous so that I could make sure my remarks were accurate. I made a tape recording of the conversation and played part of it at the 1971 Founders Day meeting, which was held in the gymnasium at the University of Akron with a couple of thousand people present. So many people have asked for a transcript of the recording that I have finally had one typed. Attached is a copy of the transcript, which follows the tape recording as closely as possible, with only my own remarks and some of the conversational asides and redundancies edited out. The first meeting of Bob and Bill, described in the attached transcript, took place in the summer of 1935 in Henrietta’s house in Akron, which was the Gatehouse of Stan Hywet Hall, then my family’s estate, now the property of Stan Hywet Hall Foundation. Henrietta was not an alcoholic. She was a Vasser college graduate and a housewife with three teenage children. She, like Bob and Bill, would be deeply disturbed by any inference that she or they possessed any extraordinary virtues or talents. On the contrary, they would all emphasize the power of ordinary people to change their lives and the lives of others through the kind of spiritual discipline so successfully exemplified in Alcoholics Anonymous. I am happy to make this transcript available to persons who are sincerely interested in learning more about Alcoholics Anonymous and its message. It is a way of sharing some of the insight’s which made and still make Alcoholics Anonymous a vital force in people’s lives. I ask only that the transcript be held in the spirit in which it is offered and not used for publicity or in an effort to magnify any individual. I would like to tell about Bob in the beginning. Bob and Ann came into the Oxford Group, which, as you know, was the movement which tried to recapture the power of first Century Christianity in the modern world, and a quality of life which we must always exercise. Someone spoke to me about Bob Smith’s drinking. He didn’t think that people knew it. And I decided that the people who shared in the Oxford group had never shared very costly things to make Bob lose his pride and share what he thought would cost him a great deal. So I decided to gather together some Oxford Group people for a meeting, and that was in T. Henry Williams’ house. We met afterwards there for five or six years every Wednesday night. I warned Ann that I was going to have this meeting. I didn’t tell her it was for Bob, but I said, “Come prepared to mean business. There is going to be no pussyfooting around. And we all shared very deeply our shortcomings, and what we had victory over, and then there was silence, and I waited and thought, “Will Bob say something?” Sure enough, in that deep, serious tone of his, he said, “Well, you good people have all shared things that I am sure were very costly to you, and I am going to tell you something which may cost me my profession. I am a silent drinker, and I can’t stop.” This was weeks before Bill came to Akron. So we said, “Do you want to go down on your knees and pray?” And he said, “Yes.” So we did. And the next morning, I, who knew nothing about alcoholism (I thought a person should drink like a gentleman, and that’s all), was saying a prayer for Bob. I said, “God, I don’t know anything about drinking, but I told Bob That I was sure that he lived this way of life, he could quit drinking. Now you have to help me.” Something said To me – I call it “guidance” – it was like a voice in the top of my head – “Bob must not touch one drop of Alcohol.” I knew that wasn’t my thought. So I called Bob, and said I had guidance for him – and this is very important. He came over at 10 in the morning, and I told him that my guidance was that he mustn’t touch one drop of alcohol. He was very disappointed, because he thought guidance would mean seeing somebody or going someplace. And then – this is something very relevant – he said, “Henrietta, I don’t understand it. Nobody understands it.” Now that was the state of the world when we were beginning. He said, “Some doctor had written a book about it, but he doesn’t understand it. I don’t like the stuff. I don’t want to drink.” I said, “Well, Bob, that is what I have been guided about.” And that was the beginning of our meetings, long before Bill ever came. Now let me recall some of Bills very words about his experience. Bill, when he was in a hotel in Akron and down to a few dollars and owed his bill after his business venture fell through, looked at the cocktail room and was tempted and thought, “Well, I’ll just go in there and get drunk and forget it all, and that will be the end of it.” Instead, having been sober five months in the Oxford Group, he said a prayer. He got the guidance to look in a ministers directory, and a strange thing happened. He just looked in there, and he put his finger on one name: Tunks. And that was no coincidence, because Dr. Tunks was Mr. Harvey Firestone’s minister, and Mr. Firestone had brought 60 of the Oxford Group people down there for 10 days out of gratitude for helping his son, who drank too much. His son had quit for a year and a half or so. Out of the act of gratitude of this one father, this whole chain started. So I, who was desperate to help bob in something I didn’t know much about, was ready. Bill called, and I will never forget what he said: “I’m from the Oxford Group and I’m a Rum Hound.” Those were his words. I thought, “This is really manna from Heaven.” And I said, “You come right out here.” And my thought was to put those two men together. Bill, looking back, thought he was out to help someone else. Actually, he was out to get help for himself, no thought of helping anyone else, because he was desperate. But that is the way that God helps us if we let God direct our lives. And so he came out to my house, and he stayed for dinner. And I told him to come to church with me next morning and I would get Bob, which I did. Bill stayed in Akron. He didn’t have nay money. There was a neighbor of mine, John Gammeter, who had seen the change in my life brought by the Oxford Group, and I called him and asked him to put Bill up at the country club for two weeks or so, just to keep him in town. 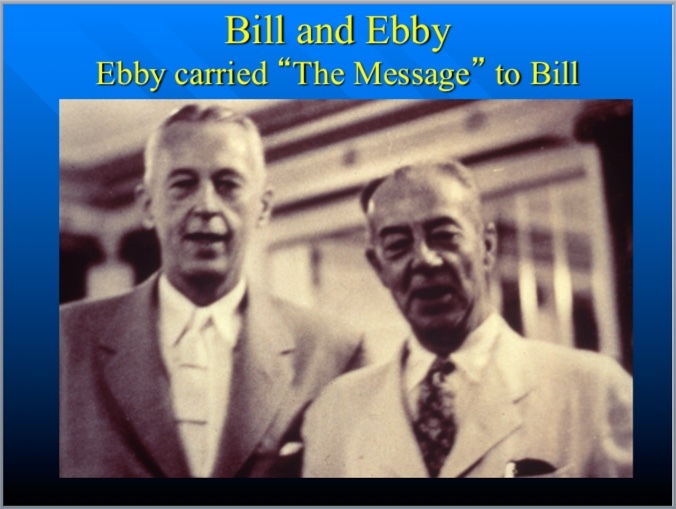 After that, Bill went to stay with bob and Ann for three months, and we started working on Bill Dotson and Ernie Galbraith. The need was there, and all of the necessary elements were furnished by God. Bill the promoter, and I, not being an alcoholic, for perspective. Every Wednesday night I would speak on some new experience or spiritual idea I had read. That’s the way we all grew. Eventually the meetings moved to King School. Some man from Hollywood came, and actor, and he said that he had been all over the country and that there was something in the King School group that wasn’t in any other group. I think it was our great stress and reliance on guidance and quiet times. Bill did a grand job. We can all see in his life what the Oxford Group people had told us in their message: That if we turn our lives to God and let him run it, he will take our shortcomings and make them valuable in His way and give us our hearts desire. And when I got the word that bill had gone on, I sat there, and it was just as if someone had spoken to me again on top of my head. Something said to me, “Verily, verily, he as received his reward.” So I went to the Bible, and there it was, in Matthew VI. Then I looked at Bill’s story in Alcoholics Anonymous where Bill had said that all his failures were because he always wanted people to think he was somebody. In the first edition of the book, he said he always wanted to make his mark among people. And by letting God run his life, God took his ego and gave him his hearts desire in God’s way. And when he was gone, he was on the front page of the New York Times, famous all over the world. So it does verify what the Oxford Group people had told him. I feel that the whole wonderful experience of Alcoholics Anonymous came in answer to a growing great need in the world, and this was met by the combination of Bill, who was a catalyst and promoter, and Bob, with his great humility (if you spoke to him about his contribution, he’d say, “Oh, I just work here.) and Ann, who supplied a honeyness for our men in the beginning. And I tried to give to the people something of my experience and faith. What I was most concerned with is that we always go back to faith. This brings me to the third thing that would be destructive to the early days, bob and Bill said to me. “Henrietta, I don’t think we should talk too much about religion or God.” I said to them, “Well, we’re not out to please the alcoholics. They have been pleasing themselves all there years. We are out to please God. And if you don’t talk about what God does, and your faith, and your guidance, then you might as well be the Rotary Club or something like that. Because God is your only source of power.” And finally they agreed. And they weren’t afraid any more. It is my great hope that they will never be afraid to acknowledge God and what he has done for them. The last AA dinner that I went to, over 3,000 people were there. And it was the first meeting that I went to which I was disappointed in. There were two witnesses there, a man and a woman, and you would have thought they were giving you a description of a psychiatrist’s work on them. Their progress was always on the level of psychology. And I spoke to Bill afterwards and I said that there was no spirituality there or talk of what God had done in their lives. There were giving views, not news of that God had done. And Bill said, “I know, but they think there were so many people that need this and they don’t want to send them away.” So there again has come up this same old bugaboo – without the realization that they have lost their source of power. This makes me think of the story of the little Scotch minister who was about to preach his first sermon, and his mother hugged him and said, “Now, Bobbie, don’t forgot to say a word for Jesus.” Your mother always wants a word for God. And then there is one other thought I’d always like to stress, and that is the real fact of God’s guidance. People can always count on guidance, although it seems elusive at times. The acceptance of an opportunity to take the A.A. plan to a sufferer of alcoholism entails very real and critically important responsibilities. Each member, undertaking the sponsorship of a fellow alcoholic, must remember that he is offering what is frequently the last chance of rehabilitation, sanity or maybe life itself. No one reaps full benefit from any fellowship he is connected with unless he whole-heartedly engages in its important activities. The expansion of Alcoholics Anonymous to wider fields of greater benefit to more people results directly from the addition of new, worth-while members or associates. Until an individual has assumed the responsibility of setting a shaking, helpless human being back on the path toward becoming a healthy useful, happy member of society, he has not enjoyed the complete thrill of being an A.A.
Because of the wide range of the A.A. activities, the names often come from unusual and unexpected places. These cases should be contacted as soon as all facts such as: marital status, domestic relations, financial status, drink habits, employment status and others readily obtainable are at hand. 1.The man* really has a drinking problem? 2. Does he know he has a problem? 3. Does he want to do something about his drinking? 4. Does he want help? *The masculine form is used throughout for simplicity, although it is intended to include women as well. Sometimes the answers to these questions cannot be made until the prospect has had some A.A. instruction, and an opportunity to think. Often we are given names, which upon investigation, show the prospect is in no sense an alcoholic, or is satisfied with his present plan of living. We should not hesitate to drop these names from our lists. Be sure, however, to let the man know where he can reach us at a later date. A.A. is a fellowship of men and women bound together by their inability to use alcohol in any form sensibly, or with profit or pleasure. Obviously, any new members introduced should be the same kind of people, suffering from the same disease. In some instances an individual might believe himself to be a social drinker when he definitely is an alcoholic. In many such cases more time must pass before that person is ready to accept our program. Rushing such a man before he is ready might ruin his chances of ever becoming a successful A.A.. Do not ever deny future help by pushing too hard in the beginning. Some people, although definitely alcoholic, have no desire or ambition to better their way of living, and until they do…….. A.A. has nothing to offer them. In many cases a man’s physical condition is such that he should be placed in a hospital, if at all possible. Many A.A. members believe hospitalization, with ample time for the prospect to think and plan his future, free from domestic and business worries, offers distinct advantage. In many cases the hospitalization period marks the beginning of a new life. Other members are equally confident that any man who desires to learn the A.A. plan for living can do it in his own home or while engaged in normal occupation. Thousands of cases are treated in each manner and have proved satisfactory. The following paragraphs outline a suggested procedure for presenting the A.A. plan to the prospect, at home or in the hospital. 1. In calling upon a new prospect, it has been found best to qualify oneself as an ordinary person who has found happiness, contentment, and peace of mind through A.A. Immediately make it clear to the prospect that you are a person engaged in the routine business of earning a living. Tell him your only reason for believing yourself able to help him is because you yourself are an alcoholic and have had experiences and problems that might be similar to his. 3. In many instances the prospect will have tried various means of controlling his drinking, including hobbies, church, changes of residence, change of associations, and various control plans. These will, of course, have been unsuccessful. Point out your series of unsuccessful efforts to control drinking…their absolute fruitless results and yet that you were able to stop drinking through application of A.A. principles. This will encourage the prospect to look forward with confidence to sobriety in A.A. in spite of the many past failures he might have had with other plans. 4. Tell the prospect frankly that he can not quickly understand all the benefits that are coming to him through A.A.. Tell him of the happiness, peace of mind, health, and in many cases, material benefits which are possible through understanding and application of the A.A. way of life. 5. Explain the necessity of reading and re-reading the A.A. book. Point out that this book gives a detailed description of the A.A. tools and the suggested methods of application of these tools to build a foundation of rehabilitation for living. This is a good time to emphasize the importance of the twelve steps and the four absolutes. 6. Convey to the prospect that the objectives of A.A. are to provide the ways and means for an alcoholic to regain his normal place in life. Desire, patience, faith, study and application are most important in determining each individual’s plan of action in gaining full benefits of A.A.
7. Since the belief of a Power greater than oneself is the heart of the A.A. plan, and since this idea is very often difficult for a new man, the sponsor should attempt to introduce the beginnings of an understanding of this all-important feature. 9. To give the new member a broad and complete picture of A.A., the sponsor should take him to various meetings within convenient distance of his home. Attending several meetings gives a new man a chance to select a group in which he will be most happy and comfortable, and it is extremely important to let the prospect make his own decision as to which group he will join. Impress upon him that he is always welcome at any meeting and can change his home group if he so wishes. These suggestions for sponsoring a new man in A.A. teachings are by no means complete. They are intended only for a framework and general guide. Each individual case is different and should be treated as such. Additional information for sponsoring a new man can be obtained from the experience of older men in the work. A co-sponsor, with an experienced and newer member working on a prospect, has proven very satisfactory. Before undertaking the responsibility of sponsoring, a member should make certain that he is able and prepared to give the time, effort, and thought such an obligation entails. It might be that he will want to select a co-sponsor to share the responsibility, or he might feel it necessary to ask another to assume the responsibility for the man he has located. IF YOU ARE GOING TO BE A SPONSOR…BE A GOOD ONE! 1918 (January 24) – Bill W. marries Lois B. 1935 (May 12) – Bill & Dr. Bob meet for the 1st time in Akron OH at Henrietta Seiberling’s Gate House. It was Mother’s Day. 1936 (November) – Fitz M. leaves Towns Hopital to become NY area’s AA #3, besides Bill W. & Hank P.
1939 (November) – Bill & Lois visit Cleveland group founder Clarence S.
1939 (December) – Bert the tailor lends $1,000 to Works Publishing Co.
1940 (February) – Houston Press runs first of six anonymous articles on AA by Larry J. 1945 (February 5) – Time Magazine reported Detroit’s WWJ radio station’s pioneer broadcasts by AA’ers, 1st such radio program in U.S.
1989 (April) –“My Name is Bill W.”, a Hallmark Hall of Fame presentation on ABC TV was broadcast at 9 p.m.
1994 (October) – The Nat’l. Council on Alcoholism & Drug Dependence has its 50th Anniversary with a dinner at the Hyatt Regency Hotel in Washington, D.C.